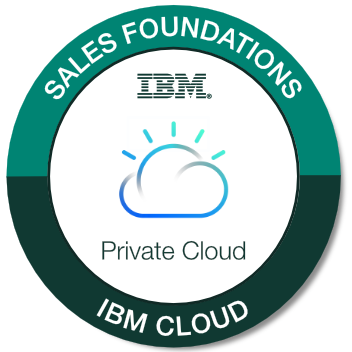 The badge earner has a broad understanding of the market drivers, business needs and benefits of private cloud and the IBM Cloud Private and Application Platform solutions that help clients to leverage the power of private cloud while modernizing existing applications and workloads. They understand how to leverage the WebSphere family of offerings with IBM Cloud Private. They can communicate the value and benefits of IBM private cloud solutions to clients. Pass the Private Cloud Assessment Test with a score of 80% or higher. Optional: Review the Private Cloud Sales Foundations Learning Roadmap.